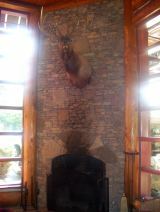 of the place with its traditional mountain craft decorations and massive log beamed rustic look. When you first enter the front lobby, there is the pleasant smell of an open wood fire. We really liked the rustic lodge feel with the fireplace in the front lobby area offering a great place to just sit and enjoy. Our room has two queen beds, a fireplace and balcony overlooking the river. The room was actually quite spacious and very nicely decorated in a mountain lodge theme. I guess we would call it a craftsman style room décor and was very nicely furnished. Our room balcony was on the mountain stream, as we requested. It had a sliding glass door that led outside which was large enough for two chairs and a table. It was so delightful and relaxing to listen to the mountain stream. After taking in the wonderful morning view, you can take advantage of the continental breakfast in the lodge. It definitely filled up all three boys and we were energized to start the new day. Or, you can choose to eat on your balcony and still get to enjoy the scenery. If you are not feeling up to going around and seeing the other great attractions that Gatlinburg has to offer, you can just spend the whole day at the Bearskin Lodge Gatlinburg and feel well rested. We really enjoyed the warm water in the lazy river and swimming pool for a little down time and relaxation! If you have decided to stay at Bearskin Lodge Gatlinburg but do not know what to expect in the area or want to try out something different, the resort offers some vacation packages. On our first stay here, we chose to go on a real family adventure by trying the exhilarating white water rafting. Its wet, its fast and it’s an adventure that we will never forget! No need to worry if you have never tired this before since a professional guide will be with you. Be sure to have pictures or videos taken to provide you a lasting memory of this ride of a lifetime! The first part of the day is a 2-hour guided hike to Big Creek which includes a deli style lunch. The final leg is a 2-hour rafting trip down the Pigeon River. This was definitely one of the highlights of our entire stay in Bearskin Lodge Gatlinburg. The white water rafting package is something you will surely enjoy and reminiscing with your children many years from now. On our second trip to the Bearskin Lodge we decided to sign on for the Dixie Stampede Gatlinburg vacation package. Each ticket includes the pre-show opening act, the main show in the big arena and a four-course dinner. Just click on Show Time to find out how much fun we had on our evening at the Dixie Stampede show. A lot of people are looking for vacation spots that allow them to escape the usual buzz of the city. We were in search for a location where we could enjoy nature at its best while still having the amenities of a hotel. The Bearskin Lodge Gatlinburg offers a unique mix of nature and history while providing its guest the luxuries of staying in a state-of-the-art resort. Like us, you can enjoy being one with nature and also get a memorable trip at the same time.